Sterling Silver 925 Oval Cable Engraved Bracelet 8x10mm 8"
Make the perfect gift for Mother's Day with sterling silver bracelet chain and cute letter charms! You could even personalise this design by using the letters to spell out a name or initials! Finish the piece with a sparkling Swarovski bicone and heart charm. 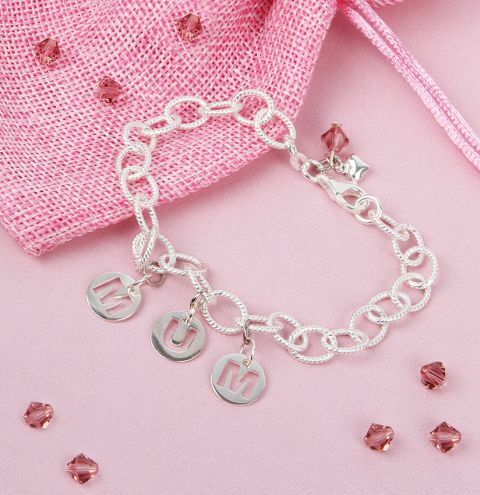 Find the centre of your bracelet and on the middle link, connect the 'U' letter to it with a jumpring. Skip a link either side and then attach both of the 'M's. Slide a bicone onto a headpin, make a loop and attach it to a jumpring. Connect the heart charm to the same jumpring and link it to one end of the bracelet.